After breakfast, Victoria invited Vicky into her room to dress, and they had their hair done. For her wedding, Vicky wore a gown of white silk moiré over a petticoat flounced in lace and wreathed in sprays of orange blossom and myrtle. Her train was trimmed with white satin ribbons and lace. Her lace veil was held in place by a matching wreath, and she wore a diamond necklace, earrings, and brooch. The Queen, who had chosen lilac silk moiré with a velvet train, wore the crown diamonds and a royal diadem of diamonds and pearls. Before they left for the chapel, Vicky gave her mother a “very pretty” brooch with a lock of her hair, saying, “I hope to be worthy to be your child!” She was also daguerreotyped with her parents. This early photographic process required the subject to remain utterly still for between thirty seconds and one minute. Although Vicky came out quite well, Victoria trembled so much that her likeness was a blur. It was a brilliant winter day, and the street were filled with thousands of people waiting since dawn to watch the procession that led from Buckingham Palace to St. James’s Chapel. They were not disappointed. There were some eighteen carriages with outriders, over three hundred soldiers and 220 horses, along with carriage drivers and musicians. One carriage bore three of Vicky’s sisters,* dressed in white lace over pink satin. With the spectators in place, the participants entered, preceded by trumpets and drums. 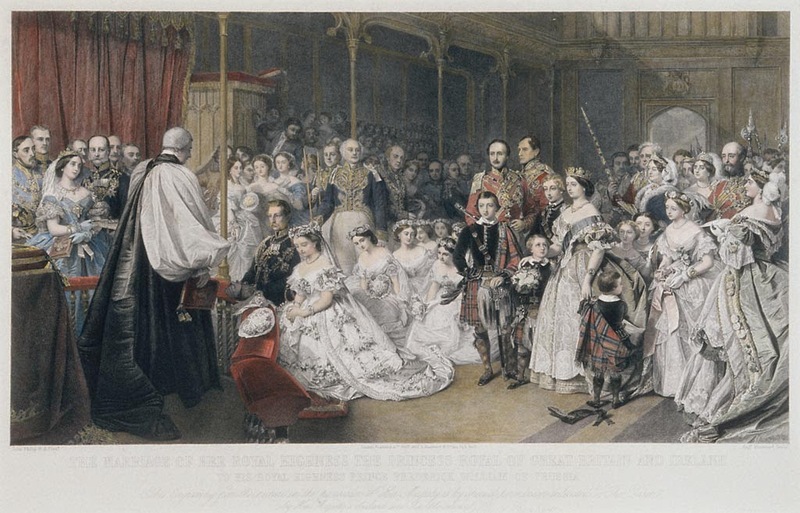 “[T]he effect was thrilling & striking as one heard the music coming nearer & nearer,” said Victoria. “Fritz behaved with the greatest self-possession… bowing to us, & then kneeling down before the altar in a most devotional manner.” He wore the dark blue tunic and white trousers of the Prussian Guards and carried his shining silver helmet in his hand. The bride and groom walked out of the chapel to the Mendelssohn “Wedding March,” composed sixteen years earlier and played for the first time at a royal wedding.